Well, that pretty much wraps things up. Today has been a day of packing, more packing, loading, more loading… all followed by the promise of a well-deserved party this evening! …the biologists collected 1124 samples, representing 13 phyla, 11475 individuals, 1634 octocorals and 649 solitary scleractinians!!! …we sent 6 GB of e-mails…. …thanks for reading them…and a huge thanks to Linda back in Maine for posting all of them! It’s been a fantastic cruise – team work, hard work, wonderful people and quite a bit of luck has meant that we’ve had both a successful, and really fun, time. I’d like to thank Laura and Rhian, as well as all the Raytheon staff and ships crew, on behalf of the whole science party for making it all happen so smoothly! Sunrise over Punta Arenas (M. Taylor). Arriving at the dock (K. Hendry). Kais, Tina, Andrew, Mariana and David packing up the dry lab… it looked so different a few days ago! (K. Hendry). John and Ben loading the Tow Cam van (K. Hendry). To begin this blog entry, I would like to thank everyone that made my participation on this cruise possible. 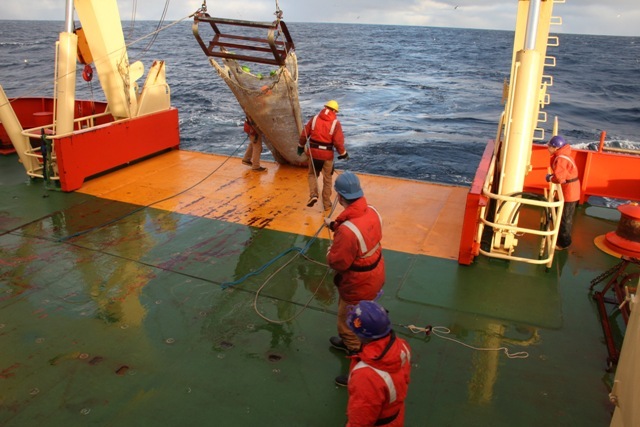 With the harvesting of deep-sea biology, fossils, and, of course, the amazing day in the Bransfield Straights, this expedition has been an extraordinary opportunity, which I will never take for granted. As this trip winds to an end, we have begun packing, cleaning, and preparing for landfall. We are all working together in one shift again, and everything seems to be going smoothly. With a few moments of spare time, we were able to put science aside for a minute and tour the world below what has been our life for the past month. Our tour began by using a stairwell that I only knew existed, but had not yet explored. This stairwell brought us directly beneath our biology laboratory and ended in the main control room for all mechanical operations. 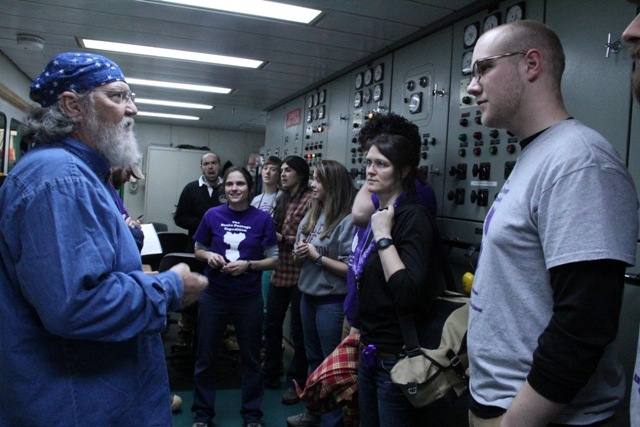 The control room overlooks 4 diesel generators used to power the ship, and it is here where one or both of the engineers on duty monitor the mechanical operations of the entire vessel. Under normal conditions, 2 of the 4 generators remain in operation. One generator could handle the electrical demand, but running the second generator ensures a steadier, uninterrupted source of electricity. Next, we listened to facts about the engines responsible for the locomotion of the ship. With 2 separate drive trains, this ship has 2 massive engines on each propeller shaft. During this cruise, only 1 engine per propeller was utilized. Running at 900 rpms each, the 2 engines provide the vessel with a speed of approximately 10-13 knots. Operating all 4 engines does not translate to higher speeds, but provides the necessary momentum needed for the ship to break through sea ice. On an average day at sea, while operating 2 engines, the Palmer consumes 6-8 thousand gallons of fuel per day, roughly 14,000 gallons per day while breaking ice with all 4 engines in operation, and another 1200 gallons per day to supply the 2 electrical generators. Potentially consuming 20,000 gallons of fuel per day, the Palmer is equipped with a 500,000-gallon fuel tank! 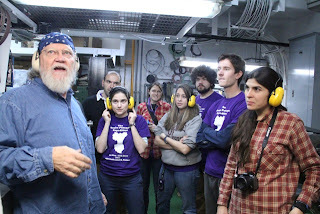 After our explanation of the mechanics of the ship, we were given earplugs and entered the engine room. We walked through a machine shop complete with a sand-blaster, metal lathe, welder, and of course the espresso machine. Next we toured the generator room, and engine room. With so much noise, this part of the tour consisted of taking pictures and communicating with hand gestures. 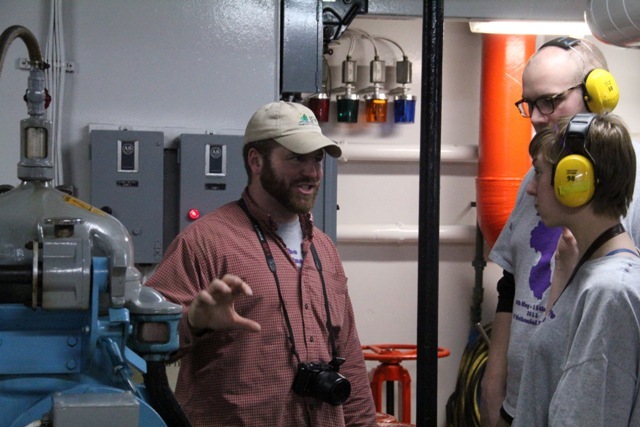 The Nathaniel B. Palmer is truly a remarkable piece of engineering, but none of this trip would have been possible without the crew diligently keeping all operations in motions. I would like to close by extending my gratitude to the captain, shipmates, marine technicians, marine science technicians, the kitchen staff, the maintenance staff, and the engineers for their hard work, great attitudes, and tireless service. Weather: temperature 37 °F, windchill 25 °F, windspeed 20-30 knots, dropping to 10 knots; sun, wind and rain! 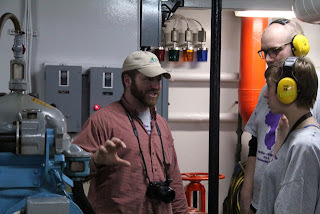 Richard, an engineer on the ARV Nathaniel B Palmer starts the tour of the engine rooms in the control center (A. Margolin). 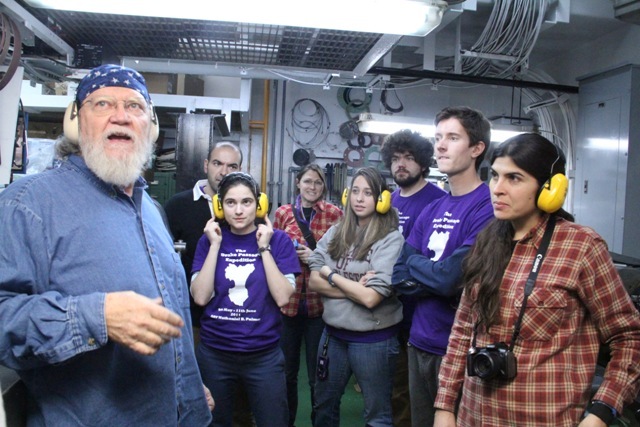 In the engine rooms the noise of the engines is so loud that everyone has to wear ear protectors (A. Margolin). Chris explains to Suzy and John about the speed at which the fuel is injected into the engine (A. Margolin). The full moon shining down through clear skies a couple of nights ago in the Drake Passage (S. Jennions). Go Team Purple! All the gang on the helo deck this morning (A. Margolin). Today was the last day of science on cruise NBP1103. Although tinged with the sadness that accompanies the end of such an exciting trip, it turned out to be a fantastic day for the reunion of the day shift and the night shift. Friends and colleagues that I hadn’t really seen for the past month, including my cabin mate, were suddenly working side-by-side with me. The day started, for me, with a slightly earlier breakfast (in order for me to adjust to a normal working day) followed by processing with Andrea some water brought up by the Tow Cam. 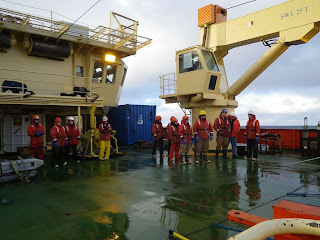 Then, just before lunchtime (confusingly, what used to be my breakfast time… sigh…), the final trawl of the cruise was recovered and the whole science team headed out to the sunny back deck. 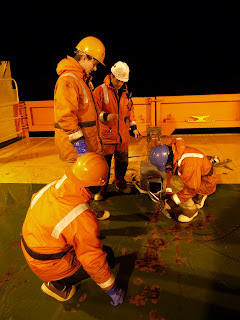 I was delighted to be rubbing shoulders with the likes of Eric, Sebastian and Michelle, night shift biologists, picking through the trawl material. It was fun being able to chat to MTs Stian and Mark, who I normally only get to make fun of for a few minutes each day. Weather: temperature 37 ºF, windchill 10 ºF, wind speed 10-20 knots and increasing, sunny! Stian and Mark recover the kasten core last night. The kasten core is a heavily weighted metal tube designed to recover intact sediments from the seafloor (K. Mohamed Falcon). 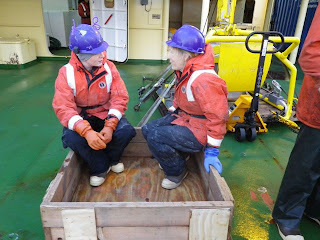 Rhian and Laura having an executive meeting in the dredge box. Everyone, day and night shifts, waiting for the final trawl to be recovered… spirits and hopes were high! (R. Waller). 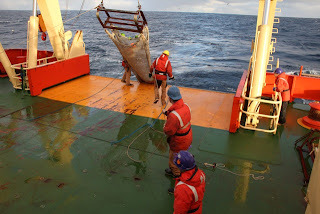 Recovery of the last trawl of the cruise this morning. 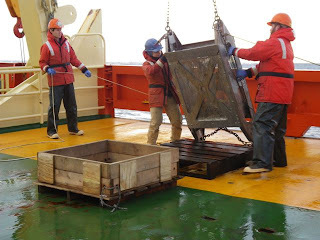 The trawl brought up corals, sponges, bivalves, echinoderms, as well as fossils. Everyone was happy! (A. Margolin). As we near the end of our cruise, I believe we’re all thinking back to our favorite moments, those times of inspiration, excitement and fulfillment. One of the team, Andrea, was inspired to express some of those feelings in poetry, which we would like to share with you today. Diving and jumping ‘long the waves in between. Only waves, clouds and sunshine or the stars far above. A Bransfield Strait transit! My spirits did lift. Scenery and icebergs beyond imagination! But it was only a fur seal; no penguin for me. “You’re kidding!” I cried, “Not again! Why me? The anguish I felt, the utter despair! I stomped my foot and I pulled on my hair. For me to see a penguin (I tried hard as I could!). I resigned myself to it and said, “Maybe next time? “Do you see that iceberg straight off the bow? Several black creatures on a background of white. The joy and excitement was full and complete. This feeling and memory, I will never delete. But it wasn’t quite over, the joy was not done! We’d get even closer! We’d have some more fun! Them waddle and stumble as they tried to flee. I could happily watch them for quite a long while. 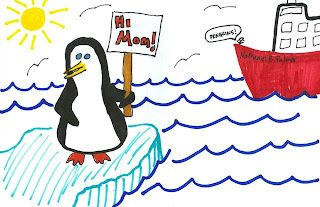 The feeling I had on my first penguin spotting. “Reflections of a Penguin Spotter”, by Andrea Burke aged 26-and-a-half (A. Burke). Some of the penguins from the Bransfield Straight we were fortunate to meet a few days ago (A. Margolin). Andrea, Kais, Kathy and John sorting and packing fossil corals during the night shift (R. Waller). The day shift bringing in one of the last dredges! From left to right: Sandy, Tina, Suzy, Mariana, Mercer, Andrew, Laura, Chris, David, Kate and Skip (B. Pietro). 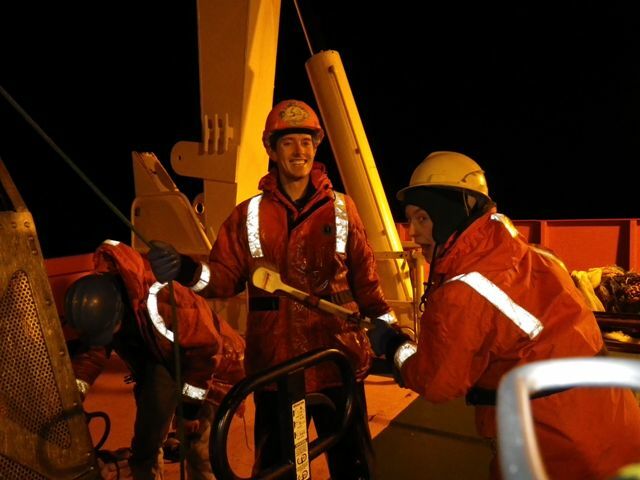 Andrew, David, Skip and Sandy preparing the kasten core for deployment (S. Jennions). 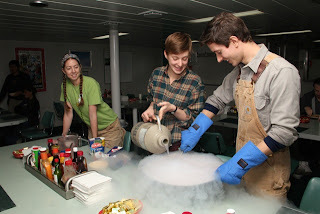 Lindsey, Suzy and David making ice cream today, from milk, sugar, strawberries, and the crucial ingredient: liquid nitrogen (A. Margolin). I like maps. Even as a child I enjoyed following the progress of a car trip on the road map. Now we have a world map on the wall in our house, to more easily visualize where family members are and to fantasize about where we might go someday. As a marine geologist, much of what I do involves learning about where things are relative to each other – is the muddy seafloor only on the continental shelf or does it extend down the slope? 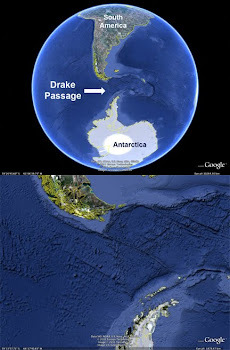 Are the mid-ocean ridge basalts exposed on all of the fracture zones? How did this piece of granite (typical of continental crust) get out here into the middle of the Drake Passage (hint… think about icebergs…)? Everything we do during this cruise is recorded with the date, time, and position. I use those positions to create maps showing where we have been, what we did while we were there, and what we found. During the cruise, we use these maps to plan where we should take the next samples. After the cruise, I will work with Rhian and Laura to try to understand why corals live in some places and not in others. Maybe one species likes steep slopes with rocky outcrops while another is found only in places where we found mud. Just from looking at the ship’s trackline, you can see a story unfolding. In the map below, the colored dots on the black trackline mark each passing hour. Each day has a different color dot. 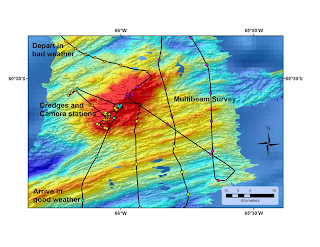 This map shows the 5 days that we worked at Interim Seamount. We arrived from the south in good weather – the hour marks are far apart because we were travelling at 10 knots. Near the center of the map you can see several places where the hour marks are almost on top of each other. These are places where we worked on station or only moved a little for a few hours while dredging or collecting bottom photographs. On the eastern side of the map, there are two almost parallel track line with hour marks pretty far apart – this is where we were collecting multibeam bathymetry data, moving right along at about 8 knots. 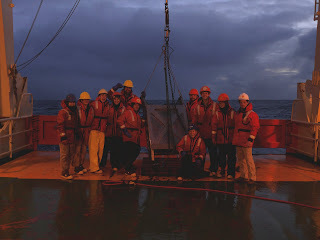 When we left Interim Seamount, the weather was bad. We had big waves (taller than a 2-story house!) and the ship could only move ahead slowly, at about 3 knots. This is about as fast as you can walk! Map of Interim Seamount showing the ARV NB Palmer’s trackline – faster when we arrived, and slower when we left! (K. Scanlon). Kathy demonstrating it’s very important to keep a close eye on the ship’s trackline (R. Waller). Ben bringing in the niskin bottle, used to sample water at depth, which was attached to the Drop Cam for the first time today (R. Waller). 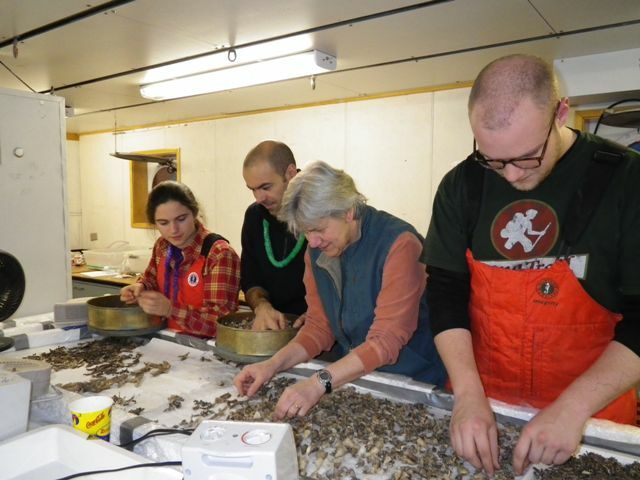 The day shift drying, sorting and packing the multitude of fossils from the Cape Horn dredges (L. Robinson). Mariana working on the biology that came up with one of the dredges today. Cape Horn is so far proving to be a treasure trove for both living and fossil corals (R. Waller). 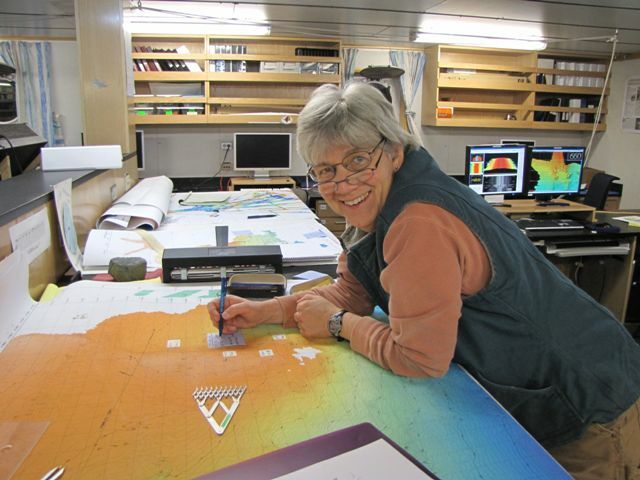 We’ve been on Cape Horn for roughly a day now, and we’re still working on completing our multibeam survey of the area. We’ve hit a patch of rough weather, and so I finally have some time to write a blog! It’s just a few days away from the completion of our science program, and it’s incredible to think about what we’ve been able to accomplish in the past month aboard. A little over a month ago I was graduating from the University of Pittsburgh with my degree in geology, and now here I am in one of the most remote areas of the world. It’s living the geologist’s dream! This is my second time aboard the Palmer, the 1st being Laura and Rhians’ pilot program back in 2008. There are many similarities, but in most regards it feels like a brand new experience. 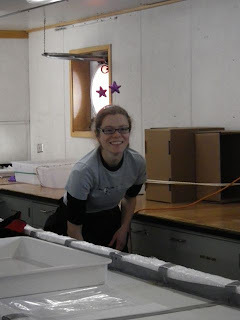 While in 2008 we were paired with a geophysics team studying the Scotia arc, now the entire time has been devoted to our paleo and biology sampling. 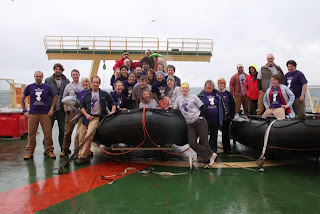 8 of us aboard were present last time, but the new additions to Team Purple have brought an incredible energy to the ship and to the work that we’ve been doing. It has been really great to be with specialists in so many areas of marine science. As a recent graduate, there’s no better opportunity than to learn coring, water sampling, and dredging from people who have been doing it for quite awhile. 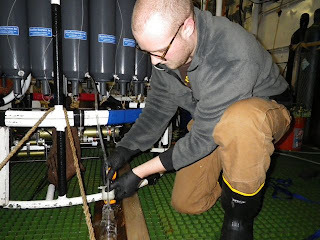 One of the biggest changes, and in my opinion one of the best, is how the science party on this cruise has been able to engage in a more physical way with the sampling. 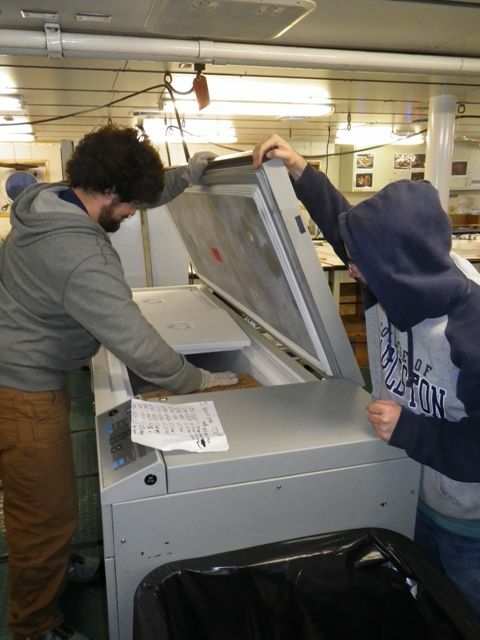 The back deck is the responsibility of the marine technicians, and it’s great to learn from them what goes in to working on the deck of a research vessel. The last cruise was a fast paced pilot program, whereas this time out every member of the science party has been able to help with launching and recovering equipment and learning how to do a lot of the day-to-day maintenance that marine science equipment requires, on top of doing our science. It makes for a great change of pace to be able to get out of the lab and to get dirty (and wet, and muddy, and cold) terminating cables and hauling dredges out of the water. On days where weather keeps us from sampling, everyone still has a ton of fun learning useful knots and skills like blade sharpening (my personal favorite!). The cruise has been a great experience, especially for someone like me who still hasn’t really begun their career. There isn’t a substitute for being with people from all over the world who all do very interesting and different science, and learning what motivated them and what their own experiences getting started in the field has been. I was 19 on the previous cruise, and still wasn’t sure if I wanted to be involved with the earth and marine sciences. But 3 years later, on the same ship, I’ve been writing my first scientific paper and getting advice on graduate school from my friends aboard. There are moments during cruises like this that you realize how lucky you are to be involved in a field like this, and for me it was when we were sailing through the Bransfield Strait. Antarctica on the left, the South Shetlands to the right, and to the front an enormous seal barking at us as we get close to hitting his personal patch of ice. I couldn’t imagine doing anything else. Weather: temperature 31 °F, windchill 1 °F, windspeed 20 knots, cloudy, snow and some sun! John water sampling from the CTD, which was deployed this morning in the good weather window we are currently enjoying (R. Waller). Sebastian and Eric storing and sorting some biological samples in a freezer kept at -80 °C (or -112 °F) for molecular analysis. So far this cruise we’ve filled an entire freezer and are half way through our second! (R. Waller). David, Sandy and Chris recovering the dredge today, which brought up some wonderful live and fossil corals (K. Hendry). Suzy giving David a bit of a clean, during dredge recovering this evening… (K. Hendry). A Terrascan image of our current weather window. The red line shows our cruise track and the white cross where we are right now. We get these images everyday to help us know when to expect both bad and good weather windows. As we wrap up NBP1103, I thought it would be fun to apply our newfound Antarctic expertise to reflect on what each of packed for this trip. What did people pack that they subsequently didn’t need? Were there items left at home that are now desperately desired? What about items that were surprisingly useful or nice to have? Approaching a month into the cruise, I can definitively say that I overpacked. Way overpacked. I-could-have-survived-being-abandoned-in-the-wild-for-a-year overpacked. Some things have been worthwhile; for example I brought 14 pairs of socks I am glad for all of them. But six short-sleeve t-shirts? Did I think I was going to the tropics? With some rare exceptions I’ve uniformly worn long-sleeve shirts. In fact, most of the clothing I wear was issued to me in Punta Arenas: our designated “Extreme Cold Weather” gear. It turns out the staff who live and work in Antarctica know exactly what you’ll need and, in my experience, the issue clothing has completely replaced my own over-stuffed luggage. I decided to ask around on the ship the three questions I posed above. The range of Antarctic packing experience in the interviewees ranges from none (ie: me!) to quite a lot (our Raytheon staff, many of whom only bring down a single backpack and count on personal and issued gear left in Punta Arenas after their last trip). 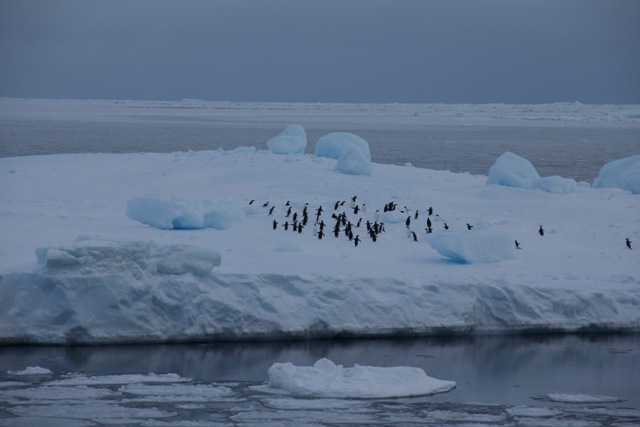 So, if you find yourself packing for an Antarctic trip anytime soon, best take a look at this list of packing regrets, surprises, and recommendations! Is there an item you brought but haven’t yet used? Laura: My own chocolate. There are so many cakes in the galley! Kais: Binoculars. The ship has them! Is there an item you didn’t bring but wish you had? Is there something you did bring and are now really glad to have? Figure 3: Kate modeling deely boppers, in case you didn’t know what they were… (R. Waller). 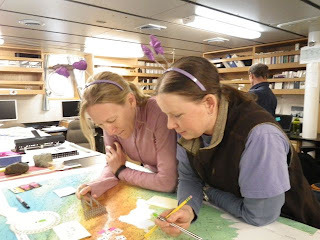 Figure 4: Laura and Rhian doing some serious contemplation at the mapping desk! 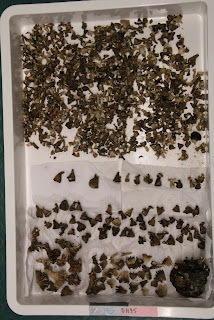 Figure 5: Meanwhile, we have been busy sorting and packing samples. Here is a tray of fossil solitary corals from one of our dredges, ready to be weighed and packed for transport (A. Margolin). 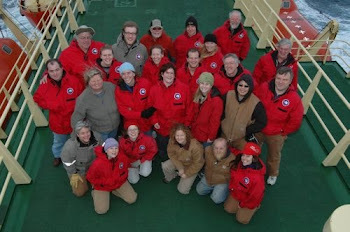 David and Andrew sporting their issued United States Antarctic Program (USAP) coats on board the ARV Nathaniel B Palmer. Kate modeling deely boppers, in case you didn’t know what they were… (R. Waller). Laura and Rhian doing some serious contemplation at the mapping desk! Meanwhile, we have been busy sorting and packing samples. Here is a tray of fossil solitary corals from one of our dredges, ready to be weighed and packed for transport (A. Margolin). Did you know there are corals in Antarctica? Many people don't! The corals that live here survive in the most extreme conditions of any corals around the world. 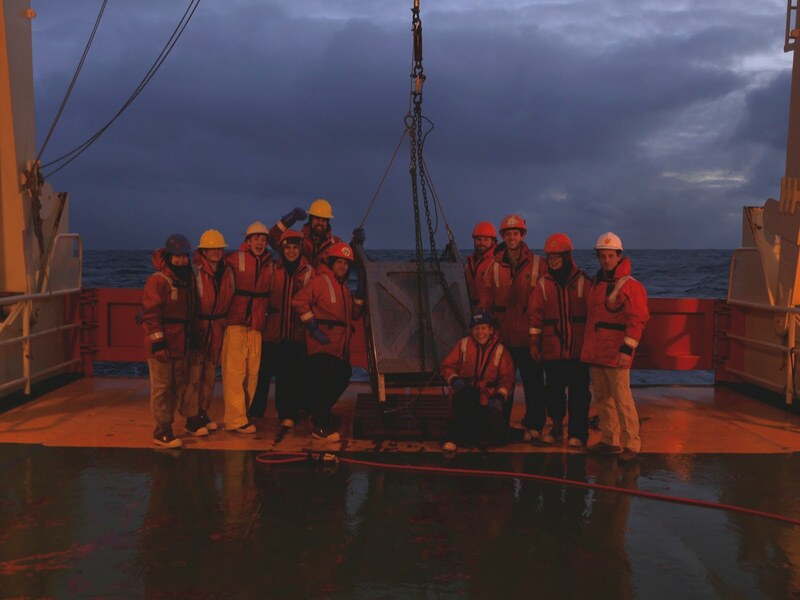 The NBP11-03 expedition will leave on the 9th May - 11th June 2011 to examine cold-water corals that straddle the Drake Passage, investigating the paleoclimate that has led to their present day biogeography. Join us on the expedition! Click on the map to see where the ship is! Click on the picture to get to know our ship! Click on the picture to explore our 2008 pilot program! All pictures and text on this site are Copyright©2011 OnlineExpeditions. Picture Window theme. Powered by Blogger.